AMMAN (Reuters) - The Syrian army and its allies have taken control of a strategic hill overlooking the Israeli-occupied Golan Heights as it pushes forward with an offensive to seize the remaining parts of the southwest from rebels, state tv and rebels said on Monday. It said the army had taken control of al-Haara hill on the second day of an offensive to take back the last parts of southwest Syria in Quneitra province that are in rebel hands and are close to the border with Israel. The hilltop, which had a major anti-aircraft radar base that was part of elaborate Syrian army defenses against Israel, and is the highest ground in Deraa province, fell into rebel hands in October 2014. 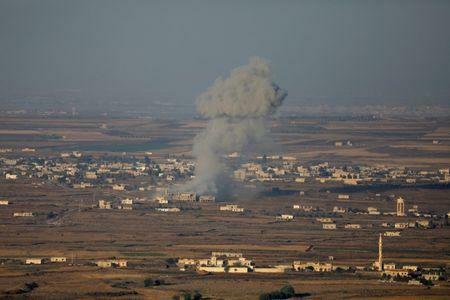 It has been heavily bombed by Russian and Syrian army raids in the past two days as the army has moved closer to the Israeli border after gaining control of most of Deraa province to the east in a push that began last June, according to rebels and a war monitor. A Syrian army source quoted by state media said the army had made territorial gains in Quneitra province where it seized the town of Mashara, about 11 km (7 miles) from the Golan frontier. Rebels said Russian and Syrian jets intensively bombed a string of rebel-held towns in Quneitra to force them to surrender in a strategy that offers rebels the choice of either evacuating to opposition-held areas or being recruited into state-run militias. The army said the rebel-held towns of Qusaiba, Sweisa and Ain Teineh had raised the national flag, but rebel sources said these towns were being bombarded into submission. The violence is taking place a few kilometers away from the line marking the start of the United Nations Disengagement Observer Force zone, an area monitored by a U.N. force since 1974 in the wake of the Arab-Israeli War. Israel has threatened a "harsh response" to any attempt by Syrian forces to deploy in that zone. Israel does not want its enemies Iran and Hezbollah, both allies of Syrian President Bashar al Assad, who are well entrenched in that area, to move forces near its border. U.S. President Donald Trump said at a news conference with Russian President Vladimir Putin on Monday in Helsinki that both had agreed to work together to help ensure Israel's security. Putin cited the need to restore the situation along the Golan borders to the state that prevailed before the outbreak of the Syrian crisis in 2011. Ahead of the summit, Israeli Prime Minister Benjamin Netanyahu met Putin in Moscow and on Sunday spoke to Trump about Iran and Syria and thanked him for his tough stance on Iran. A senior Israeli official said Netanyahu told Russia that Israel would not seek to topple its ally, Assad, but Moscow should encourage Iranian forces to quit Syria, a senior Israeli official said. The army offensive aims at completing its control of the strategic area known as the "Triangle of Death", which connects southern the Damascus countryside with Deraa and Quneitra provinces. The area is a bastion of Iranian-backed militias including Hezbollah group, according to Western intelligence sources. Israel signaled it would not impede the Syrian army offensive in Quenitra as long as it steered away from the demilitarized zone, even as it struck Syrian army posts near the frontier and elsewhere in Syria where it suspects Iranian backed forces are stationed. Syria accused Israel on Sunday of attacking the Nairab air base in Aleppo on Sunday where a Western intelligence source said the Iranian military had a presence. There were reports that several officers, including Iranians, had been killed, the source said without elaborating.